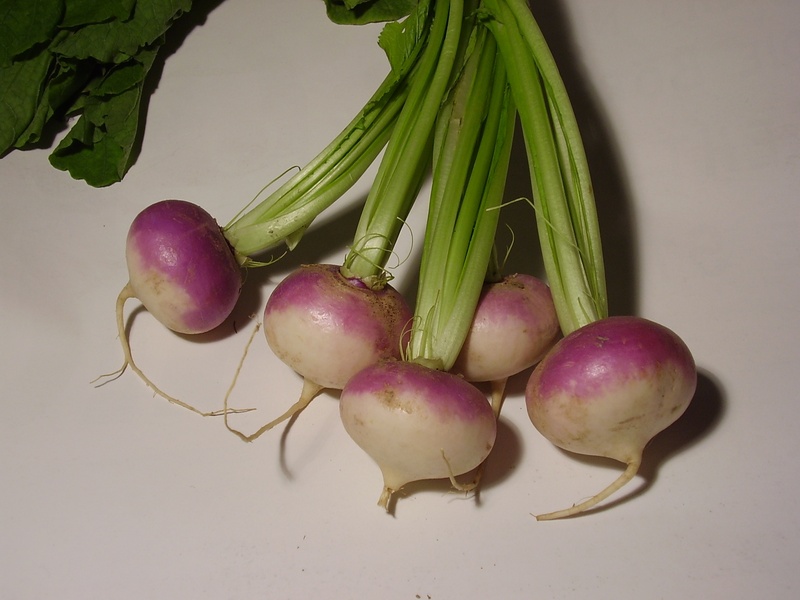 The turnip or white turnip (Brassica rapa var. rapa) is a root vegetable commonly grown in temperate climates worldwide for its white, bulbous taproot. Small, tender varieties are grown for human consumption, while larger varieties are grown as feed for livestock. The most common type of turnip is mostly white-skinned apart from the upper 1–6 centimeters, which protrude above the ground and are purple, red, or greenish wherever sunlight has fallen. This above-ground part develops from stem tissue, but is fused with the root. The interior flesh is entirely white. The entire root is roughly conical, but can be occasionally tomato-shaped, about 5–20 centimetres in diameter, and lacks side roots. The taproot (the normal root below the swollen storage root) is thin and 10 centimetres or more in length; it is trimmed off before marketing. The leaves grow directly from the above-ground shoulder of the root, with little or no visible crown or neck (as found in rutabagas). Turnip leaves are sometimes eaten as “turnip greens” (“turnip tops” in the UK), and they resemble mustard greens in flavor. Turnip greens are a common side dish in southeastern US cooking, primarily during late fall and winter. Smaller leaves are preferred; however, any bitter taste of larger leaves can be reduced by pouring off the water from initial boiling and replacing it with fresh water. Varieties specifically grown for the leaves resemble mustard greens more than those grown for the roots, with small or no storage roots. Varieties of B. rapa that have been developed only for use as leaves are called Chinese cabbage. Both leaves and root have a pungent flavor similar to raw cabbage or radishes that becomes mild after cooking. Turnip roots weigh up to about 1 kilogram, although they can be harvested when smaller. Size is partly a function of variety and partly a function of the length of time that the turnip has grown. Most very small turnips (also called baby turnips) are specialty varieties. These are only available when freshly harvested and do not keep well. Most baby turnips can be eaten whole, including their leaves. Baby turnips come in yellow-, orange-, and red-fleshed varieties as well as white-fleshed. Their flavor is mild, so they can be eaten raw in salads like radishes. The turnips root is high only in Vitamin C. The green leaves of the turnip top (“turnip greens”) are a good source of Vitamin A, folate, Vitamin C, Vitamin K and calcium. Turnip greens are high in lutein (8.4 mg / 100g). Pliny the Elder writes that he considered the turnip one of the most important vegetables of his day, rating it “directly after cereals or at all events after the bean, since its utility surpasses that of any other plant.” Pliny praises it as a source of fodder for farm animals, and this vegetable is not particular about the type of soil it grows in and because it can be left in the ground until the next harvest, it “prevents the effects of famine” for humans. In Turkey, particularly in the area near Adana, turnips are used to flavor şalgam, a juice made from purple carrots and spices served ice cold. Macomber turnip historic markerThe Macomber turnip is featured in one of the very few historic markers for a vegetable, on Main Road in Westport, Massachusetts. Recipes For turnips will be updatd soon in Ayesha’s Kitchen, Hold on!